Today I introduced the Student Empowerment Act. This bill would expand 529 College Savings Plans to include K-12 elementary and secondary school expenses for public, private, and religious schools, including homeschool students. This legislation builds on my Student Opportunity Amendment, which Congress passed and the President signed into law in December 2017, by allowing all students – including public, private, religious, and homeschool students – to use 529 savings accounts to cover eligible educational expenses, such as tutoring, standardized testing fees, and educational therapies for students with disabilities. Homeschool families were cynically excluded by Senate Democrats from the Student Opportunity Amendment, leaving homeschoolers ineligible to utilize the expanded usage of 529 savings accounts. 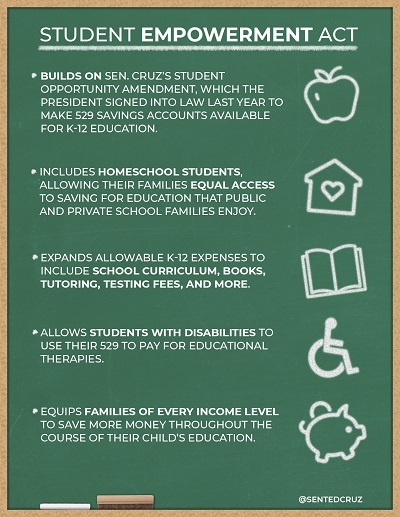 This bill rights that wrong, by re-including homeschool families as equally eligible to use a 529 savings account for educational expenses, to ensure that all families are able to use these tax-advantaged accounts to pay for their child’s elementary and secondary education. By investing in the next generation of students and expanding school choice, we’re able to allow more students to have access to an education that truly fits their child’s needs, and to escape the one-size-fits-all approach to education. Read the text of the bill here. A one page summary of the bill may be viewed here and below.